Advanced Inductor Manufacturing and Rotating Inductor Technology are two examples that demonstrate how we take an innovative approach to solving complex heating problems. A reliable coil making is critical for ensuring the repeatability of the heating pattern and minimum time of calibration and verification. This is why the mass production industry demands inductors with longer lifetime and extreme repeatability. 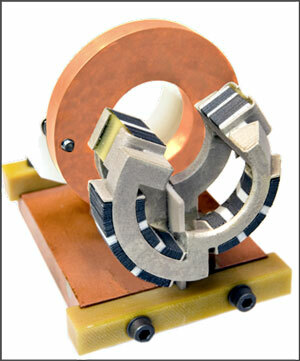 3DP Coil Solution is stardard technology for GH inductor manufacturing. Coils are manufactured with nowadays’ fastest, most efficient method: additive manufacturing by Electron Beam Melting (EBM). The coil is directly made in copper by a controlled electron beam that melts copper powder following a 3D CAD model, layer by layer. 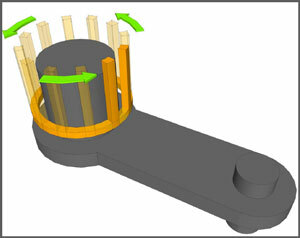 Successful induction heating relies on even, consistent, and repeatable transfer of heat from the inductor to the part. For parts with relatively simple geometry, a basic helical, round or square inductor configuration achieves the desired result. The machine moves the the part inside the inductor heating zone, the heating process occurs, and the machine removes part from the inductor. However, today's complex manufacturing processes often require parts with equally complex geometry, and the mechanics required to move complex parts through a stationary inductor can be substantial. For these applications, it is often more cost- effective to design a machine in which the inductor itself moves around the part to provide the most even and consistent heating pattern. Innovative microfusion technology increases repeatability and consistency. A rotating inductor moves around the part to provide the most even and consistent heating pattern.